Thinking about hiring a trailer? Why not give us a call first, in most cases we are cheaper, especially when you consider the cost of the trailer, tow vehicle and your time. We are fully insured, and very careful, so you don’t need to worry about your pride and joy. We also remove your unwanted cars/car bodies for a minimum charge. 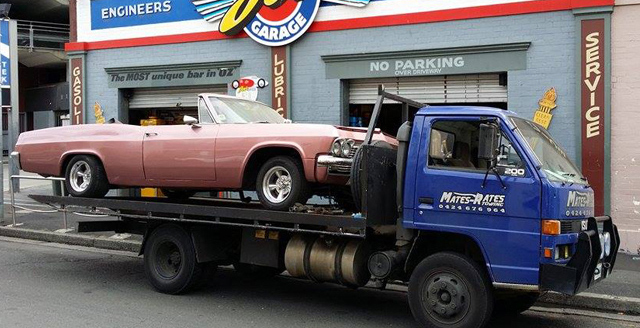 Mates Rates Towing Hobart offer great rates and a reliable service. We have available tilt tray hire, car towing, 4×4 towing, forklift towing, job site equipment towing, even pallets or freight moving. We are fully insured and ready to work! Please call or email us today for a FREE quote, visit our contact page and we will get back to you. Take a look at our image gallery for recent photos of work and like us on facebook for updates.